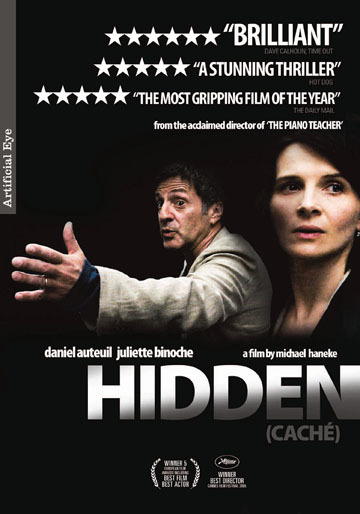 In Hidden, Michael Haneke probes the pride, class consciousness, and racial enmity of a man whose happy, comfortable, middle class family life is turned upside down by a series of intrusive and upsetting events. This utterly compelling psychological thriller from Michael Haneke - one of cinema's most daring, original and controversial directors - stars Daniel Auteuil as Georges, a television presenter who begins to receive mysterious and alarming packages containing covertly filmed videos of himself and his family. To the mounting consternation of Georges and his wife (Juliette Binoche) the footage on the tapes – which arrive wrapped in drawings of disturbingly violent images – becomes increasingly personal, and sinister anonymous phone calls are made. Convinced he knows the identity of the person responsible, Georges embarks on a rash and impulsive course of action that throws up some unpleasant facts about his past and leads to shockingly unexpected consequences. Michael Haneke, director of Award winning film The Piano Teacher has a special interest in the anonymity, conflicts, loneliness and the disorder of city life. In Hidden, Haneke probes the pride, class consciousness, and racial enmity of a man whose happy, comfortable, middle class family life is turned upside down by a series of intrusive and upsetting events that undermine his life.